Hair loss can occur for a number of reasons including genetics, hormone imbalances, illness, and even nutritional deficiencies. 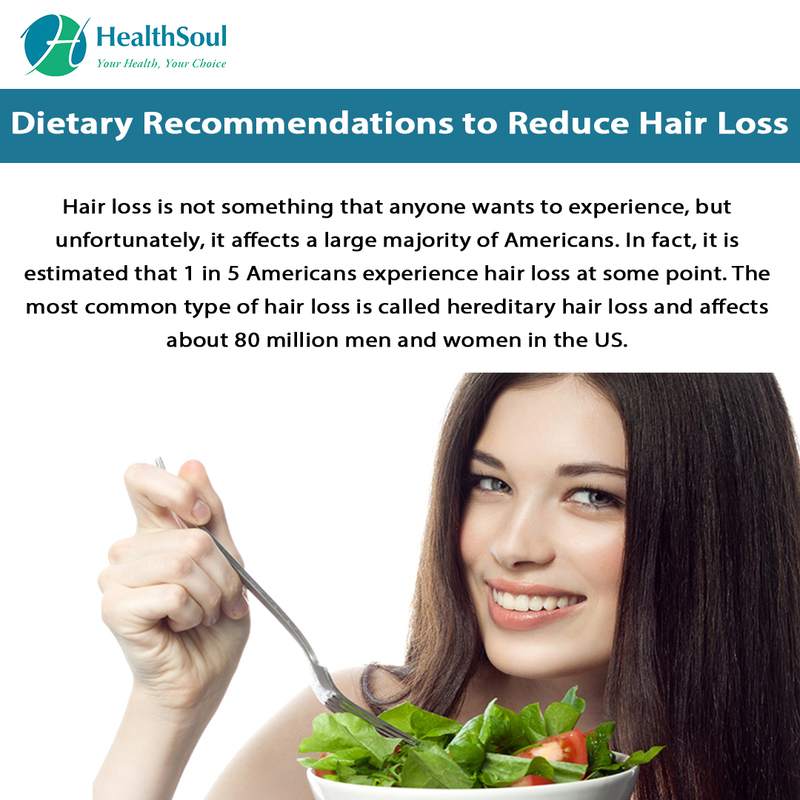 The good news is that there are some dietary changes you can make to help reduce hair loss. Let’s dive in and look at the top five foods that help reduce hair loss and promote overall healthier looking hair. #1 Make Sure you are Eating Enough Fat: Fat plays such an important role in our health for a number of reasons, and the health of our hair happens to be one of them. If you are not consuming enough fat, you may experience dry and brittle hair as well as hair loss. Essential fatty acids like omega-3’s have also been found to be especially beneficial for reducing hair loss. These fatty acids can help boost the good type of cholesterol in our blood, reduce inflammation, as well as promote better circulation all of which are an important part of supporting optimal hair growth. It’s important to get enough omega-3 fatty acids in your diet as the body is not able to produce essential fatty acids on its own. Things like wild-caught salmon, walnuts, chia seeds, and flax seeds are all great sources. #2 Eat Enough Hydrating Foods: Dry hair equals hair loss. While keeping up with your water intake is going to be key to reducing hair loss, the foods you eat also make a difference. It’s important to make sure you are consuming enough hydrating foods as well. Some great hydrating foods include grapefruit, cucumbers, bell peppers, celery, tomatoes, zucchini, and strawberries. Try to get as many of these foods into your diet as you can to promote overall wellness and strong and healthy hair that is less likely to fall out. #3 Eggs: Eggs are a rich source of biotin, which is a b vitamin most commonly known for supporting healthy hair, skin, and nails. Biotin can help reduce hair loss, and getting it from your diet VS a supplement may help improve its absorption in the body. The key to getting the biotin from the egg is to eat the egg yolk as this is where all of the vitamins and minerals are. #4 Spinach: We all know that spinach is an excellent source of iron, and makes a great addition to a healthy diet to help prevent anemia. 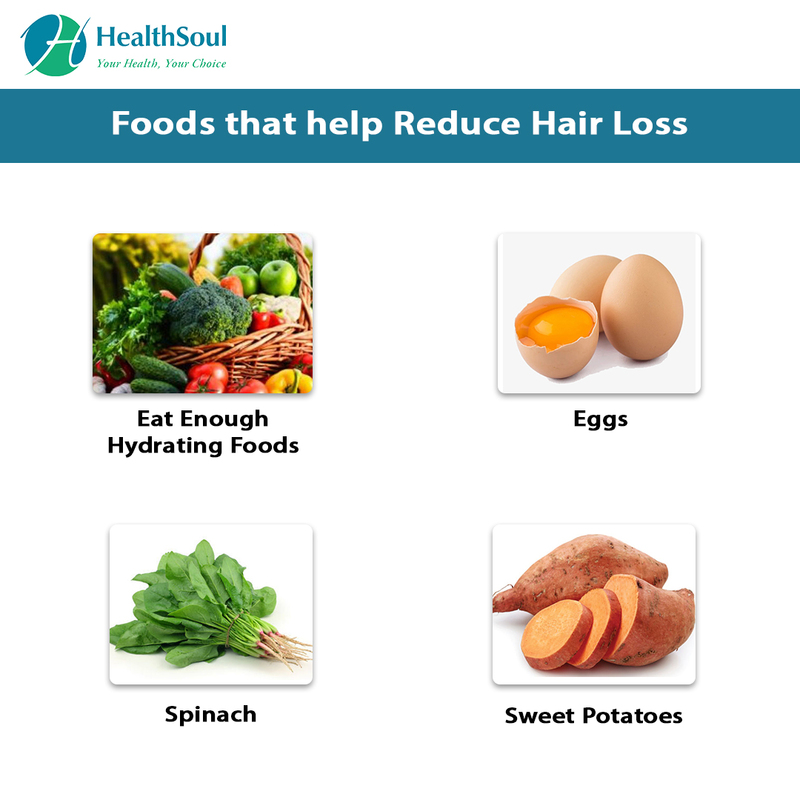 However, it also plays a role when it comes to adding foods to your diet to prevent hair loss. Since spinach is rich in iron, it will help reduce the chance of developing anemia, and anemia can lead to hair loss. When you are anemic, you are likely to experience a decrease in circulation to your hair roots which can lead to hair loss. #5 Sweet Potatoes: Sweet potatoes are loaded with vitamin C which plays an important role in collagen production. Getting enough vitamin C from our diet helps strengthen hair which will help prevent it from falling out. If you are experiencing hair loss, know that you are not alone and that there are steps you can take to prevent further hair loss. While some aspects of hair loss may be hereditary, following a nutritious diet will only help to strengthen your hair and also make it look healthy! Not only that, but these dietary recommendations support overall health, so you really have nothing to lose.